This compliance guide details the consumer-facing information that pico-solar and solar home system kit manufacturers must include in order to meet the Lighting Global Quality Standards. It is intended for marketing and communications professionals who may have limited familiarity with the Lighting Global Program and/or the Lighting Global Quality Standards. 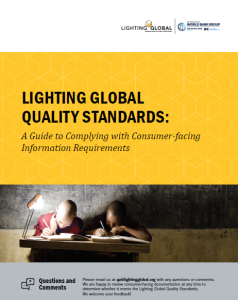 On April 11, 2019, Lighting Global Quality Assurance held a webinar on the Compliance Guide for marketing and communications professionals who may have limited familiarity with the Lighting Global program and the Quality Standards. During the webinar, the QA team reviewed some of the most common errors and reasons for failure, and highlighted tips on how to avoid them. A full recording of the webinar and presentation slides are available.